I picked up these vintage flowers at an estate sale. Yep, I said vintage. At first, I thought they were dried flowers, but they're not. Honestly, I'm not sure what they're made of. They were wrapped in tissue paper, along with a bunch of old crafting supplies. Whoever made them did an outstanding job. 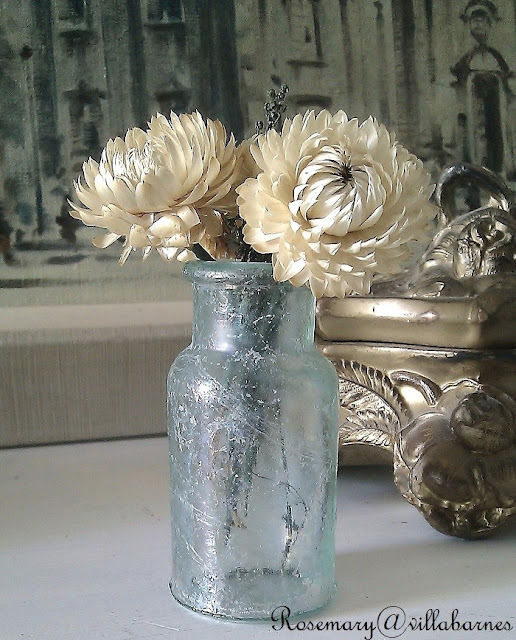 I love flowers in vintage bottles, real, or dried. These guys definitely had me fooled. They look good in my aqua bottle, but the mystery continues. Any guesses what they're made of? Okay, enough flower play. Back to work. UPDATE: Mystery Solved. Gloria at Happy To Be had some herself from the 60's. They're made of straw. After I took another look, it seems so obvious. Are you offering a prize? LOL.. my guess is satin ribbon or taffeta. Beautiful! Most of the ones I have seen before are actually made from wood. My daughter has a more crude one that the guy whittled for her in like two minutes flat at a re-enactment - from a twig - with a pocket knife. 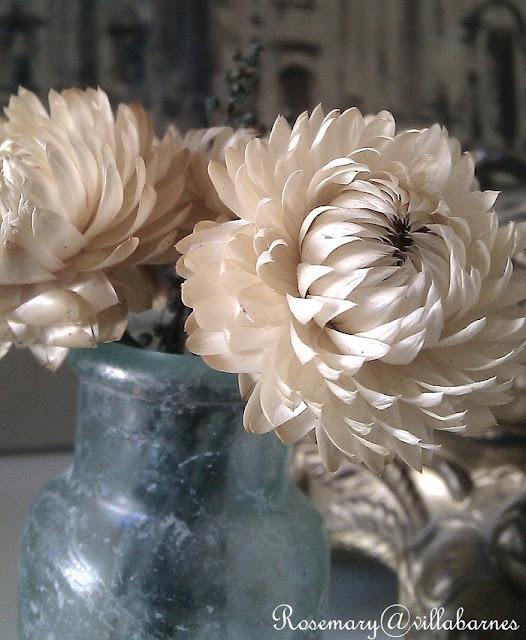 Someone with a wood carving set would be able to do these and perhaps soak them in water to put the extra curl on the petals. Amazing find, Rosemary. I gravitate towards this color constantly. Those are gorgeous! I would have to agree with one of the commenters and say maybe some sort of very fine, thin wood? Beautiful find! They're so pretty Rosemary and they look beautiful in that glass jar! Not a clue, but they sure are gorg! NO idea but they're gorgeous! They are beautiful, Rosemary. Very curious as to what they are made of. The fact that they are vintage and their look makes me think of millinery flowers used on hats years ago. I wonder if it is some type of fabric. Wow!...they are gorgeous...great, great find! Those are gorgeous and don't have a clue. If it's not wood how about rice paper, bleached feathers or corn husks? Beautiful fleurs! I would have never guessed straw! Gorgeous. 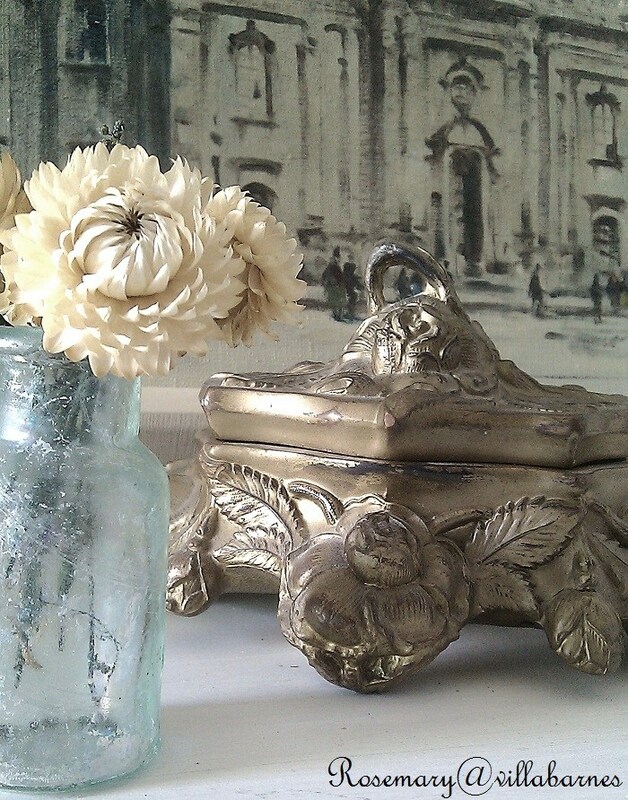 I think straw flowers will be making a comeback now.